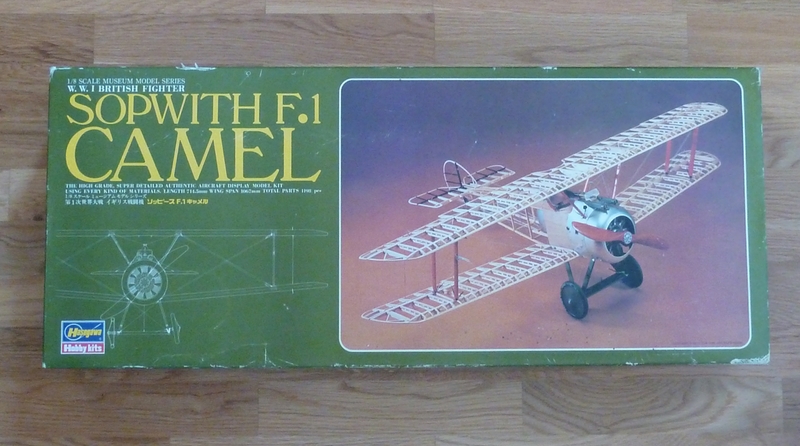 Many years ago, 20+ in fact, I went into a model shop in Hull, England and hanging from the ceiling above the counter was a truly magnificent model of an S.E.5a WWI bi-plane. The model was huge, as far as I was concerned, and finished without fabric covering so you could see all of the rigging, spars, ribs etc. I was utterly impressed. I learned later the it was one of Hasegawa’s 1:8 scale “Museum” series which also included the Fokker DR.1 and the Sopwith Camel F1. The latter is one of my favourite aircraft and I dearly wanted to get Hasegawa’s kit of it. However, as an impecunious youth, it was out of my price league and many years later when I could afford it I discovered Hasegawa had discontinued the model and all stock had been sold. I still hankered after the model though, and so periodically, usually after a few beers, I’d cruise eBay looking for one being sold on at a non-silly price. About 6 months ago I finally located one which was part of the estate of a gentleman who had recently departed. I put my bid in and it was duly accepted. As luck would have it the seller lived close to a friend who resides down London way and who would be coming up to visit me soon. Collection and delivery sorted! (thanks Kat). I could even arrange to give the seller cash at the handover which simplified things for everyone. So now I am the proud owner of my dream kit. A Hasegawa Sopwith Camel F1 in 1:8 scale. As the model is going to take me a while to complete I think I’ll put posts on here as each section is finished. That way there won’t be mammoth posts on the thing. So first…. the Clerget 9B engine. Great kit! I’ve always wanted to try a balsa model. I have an 80% complete model in the loft. All that is required is covering and painting. It stalled because I didn’t feel up to scratch building the engine, and then I forgot about it. Scratch building is a task. Especially an engine! That Kat comes in handy in all kinds of ways! I am not into WWI airplanes, but I can imagine how thrilled you were. I will keep reading your work in progress. If your interest is in WWI airplanes… then view these posts starting with this first one. I found after a long journey most probably one of the last available kits on the market and I look forward to the challenge in front of me. Your reports will be my starting point as I consider them as very valuable. I had heard of these kits over twenty-five years ago and wanted one ever since. I could never find one at a price near what I could afford. Then after joining a local garage sale group, on the same day of joining the group, I came across an ad for the 1/8 Sopwith. It was the same kit as your build here. To my amazement it came from a wealthy gentleman’s estate who had just passed. The house from which it came was eleven miles from my own. I was able to purchase the sealed unopened kit in pristine condition on October 8, 2018 for the price of $300.00. I can not tell you how much your blogs will help me in the coming months ahead. I have read both Sopwith builds twice already and have not opened the kit as yet! Thank you! I know my build will never be as amazing as yours, but lt will be better after seeing your work.